England's left wing David Duckham was in commanding form, scoring two tries in their unexpected 14-6 victory against France. England, on the back of back-to-back defeats, had an unusual inspirational pre-game speech from chairman of selectors Sandy Sanders who warned them they were "becoming a laughing stock of international rugby". Captain John Pullin led from the front, refusing to go off after being flattened and bloodied by a blind-side punch. David Walder's try in the last move of the match gave Newcastle a 30-27 win in the Tetley's Bitter Cup final in front of 71,000 at Twickenham. Seven of Newcastle's starting XV were under 24 and one of them - 21-year-old Jonny Wilkinson - had an off day with only four successful kicks from eight attempts. Moseley RFC bowed to pressure and finally admitted women into the club bar, but only after 7.30pm on match days and only if accompanied by their husband or boyfriend. "I am certain that the old presidents whose pictures harts on the wall would turn in their, graves if they knew what was going on," John Wright, the club captain, said. "But it honestly cannot be helped. We need the cash that a good bar crowd brings." The new grandstand at St Helen's was officially opened prior to the Wales-France Five Nations match. Wales won 16-8 in front of a record Swansea crowd. Rowe Harding, Melbourne Thomas and Ambrose Baker scored Welsh tries in front of 40,000 fans. France won at Twickenham for the first time, Jean Prat scoring eight points in an 11-3 victory. The inspirational flanker scored a try, conversion and drop-goal, with skipper Guy Basquet crossing for a try. England paid for not fielding a specialist kicker as five penalties were missed, and played for much of the game with 14 men after Chris Rittson-Thomas ripped an ankle tendon during the build-up to Brian Boobbyer's try. 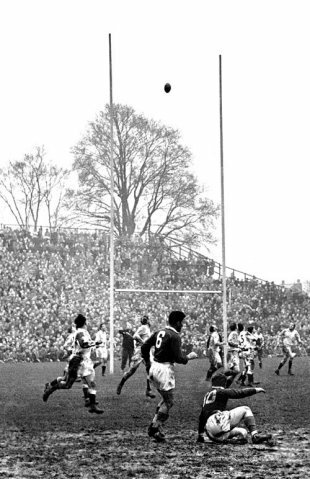 There were only 51,000 inside Twickenham because of a railway strike. The result left England at the bottom of the table, winless after three matches, although they avoided the wooden spoon with a 5-3 win over Scotland. Openside flanker Michel Crauste became the first forward to score a try hat-trick in a Five Nations match in France's 13-0 win against England in Paris. "We witnessed the utter destruction of the English type of rugby football," headlined the Daily Mail, "you could never conjure up in your wildest dreams the type of high-speed handball played by the French." The French press were triumphant with one paper headlining the front page: "The Waterloo of English rugby." Fullback Bob Hiller, who had scored 138 of England's 199 points in his 19 internationals, announced his retirement at the age of 29 after being dropped by the selectors. He had intended to quit at the end of the season and said he saw no point remaining on the fringe of the side. 1968England dominated for long periods in Paris but still returned home with nothing after sliding to a 14-9 loss. A succession of try-scoring chances were spurned in the opening onslaught but a 6-3 lead at the break was not enough as they played the second-half into a strong wind. England were also upset that a Keith Savage 'try' was disallowed by referee Barrie Laidlaw who claimed the player's foot was in touch - England pointed out that Laidlaw was woefully off the pace and made his decision from 35 yards away. 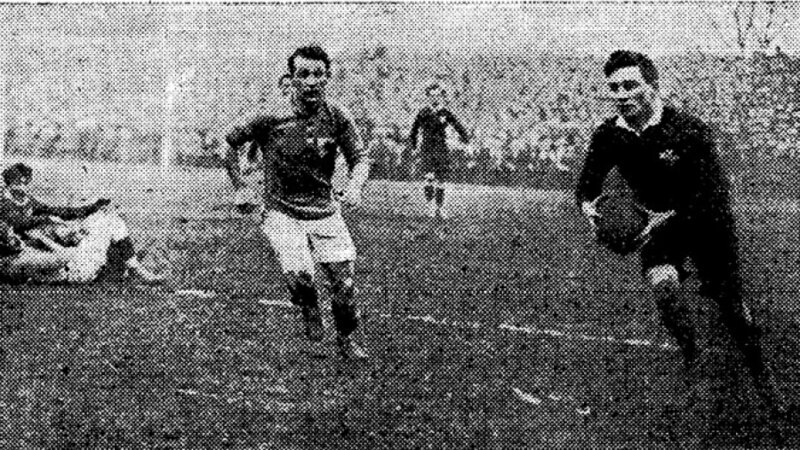 More than 25,000 turn out at Parc des Princes to watch the British Army beat their French counterparts 36-3. All 15 of the England players were pre-war internationals while the French, who largely had not touched a rugby ball since the previous year, were chosen from front-line soldiers. New Zealand lost on French soil for the first time, succumbing 11-8 to a South-West Selection at Bordeaux in front of 15,000 spectators.